The actress Martha Orlanda acted among others with the famous actor Werner Krauss in the movies "Wenn Frauen lieben und hassen" (17) and "Stürme des Lebens (18). Other movies with her were "Menschen, die durchs Leben irren" (18), "Das grosse Geheimnis" (20), "Prärieblut" (20) and "Brudermord" (22). 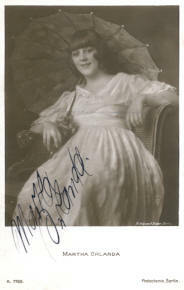 Martha Orlanda already retired from the film business at the beginning of the 20's.